Broadway legend Maurice Hines teams up again with the unforgettable Manzari Brothers for the first time since the smash hit production of Sophisticated Ladies to tap us through his incredible career in show business. With song and dance, Hines pays tribute to his brother, Gregory, and the singers who have inspired him, from Frank Sinatra to Lena Horne. To help bring the history of American tap to life, Hines brings The Diva Orchestra, an all-female nine-piece big band. Get ready to laugh, smile and tap your feet to the infectious song and dance of Maurice Hines! 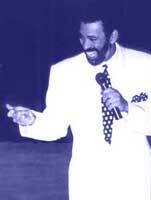 "Maurice Hines is Tappin' Thru Life started with my wanting to celebrate my brother Gregory Hines. I read an article on tap a few years ago and his name wasn't mentioned once - SO WRONG! Now I get the chance to honor him properly on how fabulous a tap dancer he was. I also wanted to thank the wonderful performers ELLA FITZGERALD, FRANK SINATRA, LENA HORNE, NAT 'KING' COLE and JUDY GARLAND who were all an inspiration to a young performer on how wonderful being on stage could be. My main focus for anytime I'm on any stage is to follow what my wonderful mother told Greg and I... that no matter what you do on stage always do it with CLASS and make sure the audiences leave saying WOW! I HAD A GREAT TIME, BABY!"